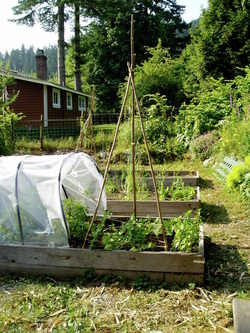 It's June in our little community garden and we want to invite more of the community into it! Bowen Heritage is seeking two students this summer, to work with families in both the garden and the orchard. To apply, send resume and covering letter to Karen Wristen at kwristen at hotmail dot com. Every year, we try something new to extend the growing season a bit. Hoop houses and cold frames can help hold the heat in our raised beds and give us hope that the carrots will yet develop! Kale, onions and beets continue to do their thing even if it freezes, but we're determined to get that winter lettuce going! Karen Wristen manages the Heritage Demonstration Garden and helps new gardeners learn about heritage food plant varieties and care of the perennial border.